Unused and bad sections appear in the registry with time. It leads to errors and poorer system performance. 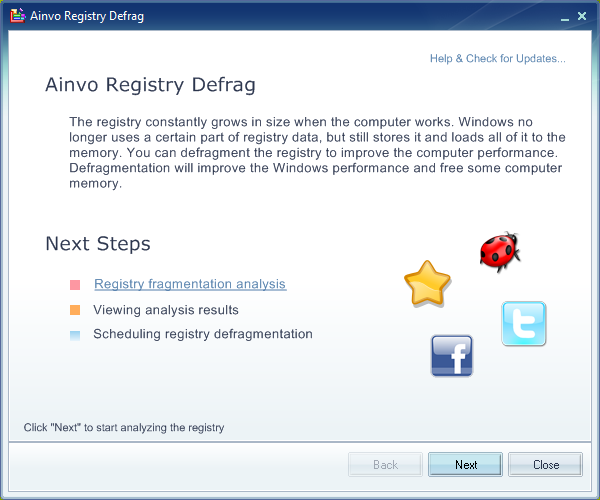 Ainvo Registry Defrag will allow you to improve the Windows performance and stability due to registry defragmentation. Ainvo Registry Defrag is designed in the form of a convenient wizard so even inexperienced users can speed up their computers. 128 Mb of RAM, 25 Mb of available disk space. ...... Ainvo Registry Defrag allows you to defragment all registry sections on all popular systems including new Windows 7 and 64-bit platforms. The dynamic defragmentation map is used to evaluate the condition of the registry. Defragmentation results are displayed in the form of a convenient and visual report. Ainvo Registry Defrag is now more stable because the defragmentation procedure is now started at the operating system startup. Tired of slow Windows load? Speed UP Your PC! Keep it working at top speed. Qweas is providing links to Ainvo Registry Defrag 4.1.7.2010 as a courtesy, and makes no representations regarding Ainvo Registry Defrag or any other applications or any information related thereto. Any questions, complaints or claims regarding this application Ainvo Registry Defrag 4.1.7.2010 must be directed to the appropriate software vendor. You may click the publisher link of Ainvo Registry Defrag on the top of this page to get more details about the vendor.